British flattrack racing comes to Motors TV in February with full coverage of one of Shorttrack UK’s most prestigious events, the Indoor Shorttrack Championship. The year’s races from Braintree’s Towerlands Park was a star-studded affair including champions at British and World level, as international cross-discipline stars went head-to-head. 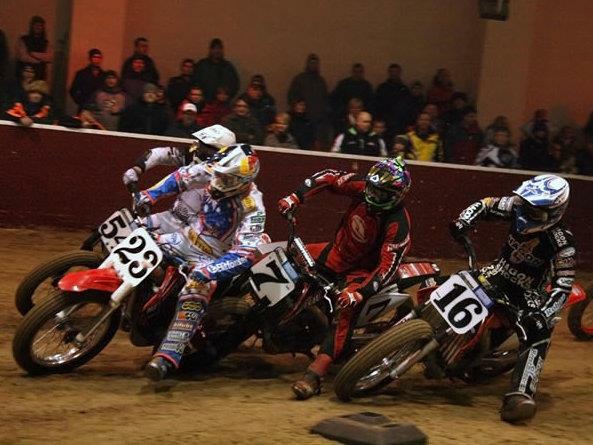 Three- time World Speedway Champion Jason Crump, and Jacopo Monti, the five-time Italian flattrack champion, joined the best of British including reigning champion Edward Kennett (a star of the shale with Speedway Grand Prix appearances to his name) and Aidan Collins, British flattrack’s number one desperate to make it an indoor and outdoor double. As well as flattrack regulars, though, the entry list really threw up some surprises, with several cross-discipline riders appearing on the dirt, including Steve Plater and Sam Lowes, both former British Supersport Champions, plus Longtrack World Cup medallist Mitch Godden. With an impressive field, a great new track layout, and the glory of number one to race for, the action was always guaranteed to be hot. Programme producer and presenter Alex Raby, said: " As AMA rider Chris Boone explained to me, it’s very much seen as a contact sport across the pond, so with that mentality coming to the tiny circuit at Braintree the racing was always guaranteed to be superb." The event therefore promises to be a feast of televised action. The 2010 Indoor Shorttrack Championship really was a bonanza: big names, great racing, and a nail-biting finish, this show is one not to be missed." The 2010 Indoor Shorttrack Championship premieres on February 17 at 9pm with repeats throughout the week.